Information as an overview - 1543934757s Webseite! In order to use ROFES MONICOR (MONICOR for short) you need a PC with a Windows operating system and a USB port. Useful for full use is also a headphone jack. MONICOR is delivered in a case with a control unit that is to be connected via USB to the PC. The programs are located on a USB stick. 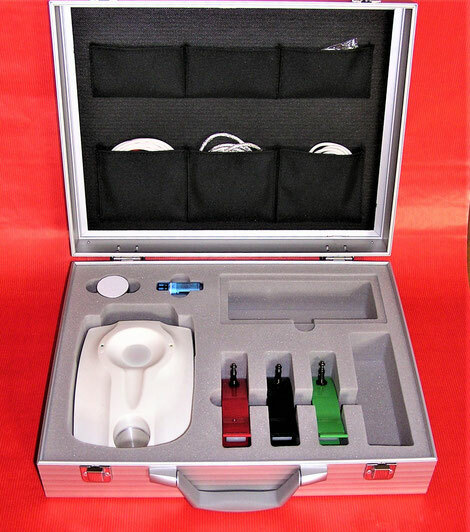 Also included in delivery are 3 cardio electrodes (clamps), several adhesive electrodes, a connecting cable between the cardio electrodes and the control unit and a connecting cable between the cardio and adhesive electrodes and the headphone socket. In addition, aluminum containers with information carriers are included in the initial configuration. 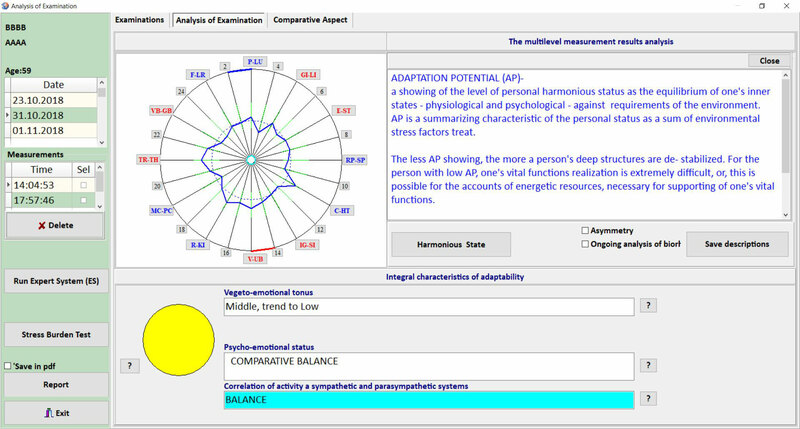 Monicor reads frequencies from the entirebody - all orgns and body pats - analyses these by comparing with normal values and thereaftr shows the health condtion. If there are deviations from normal values, the device is able to correct the frequencies and improve or restore physical organs and body parts. 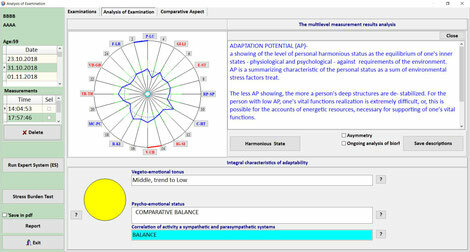 Monicor also reads the frequencies of acupuncture points and which points are weak. By selecting the weakest points and also correcting these, MONICOR offers optimal acupunctur treatment - without needles!! The progrm in MONICOR's database recognizes the frequencies from the most commonly existing parasites and is able to check if any of these are active in the body. If so, it is able to eliminate the parasites. Aditionally, MONICOR discovers coarse frequencies in the body (0 - 100 Hz) and corrects these. Coarser frequencies are controlled by finer frequencies, available in the body's fluids, cell membranes and in he DNA. In other words, we can, with the help of MONICOR, discover the symptom and affect and correct its energetic status by strengthening the acupucture points. How can MONICOR detect parasites? Monicor sends frequencies that correspond to the respective frequencies of parasites, bacteria, etc.. 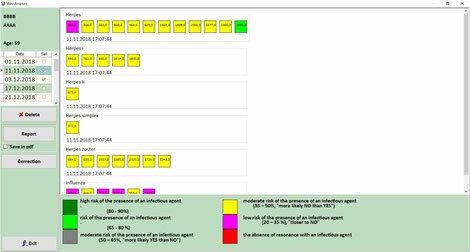 If the desired pathogens are present, they respond to the frequencies, which in turn can be measured by the system and evaluated according to the reactions. Since each pathogen has at least one specific frequency, it is highly probable that the respective pathogens can be detected. Which pathogens can be recognized by MONICOR? MONICOR can recognize about 170 pathogens (parasites, worms, bacteria, viruses, etc.). Among them are the most common pathogens. Salmonellae, hepatitis B oder C, herpes, HIV, borrelia, pneumococci, streptococci, haemophilus influenzae, campylobacter, heliobacter, SARS and many others. The MONICOR program offers different therapies that can be used either separately or together. The meridians can be regulated based on the measurement made.MONICOR independently regulates the meridians that require the highest attention.Regulating provides a constant feedback so that the system is able to react on reactions immediately. If MONICOR has detected pathogens, it is possible to treat them immediately with frequencies in a targeted manner. This frequency treatment can be supported by an individual music and color therapy. MONICOR offers the possibility to select targeted frequency therapies, which can also be supported with music or color therapy. MONICOR also offers the possibility to create information carriers for longer therapies,. These are stucked to the skin with plaster where they develop their effect in about 5 to 8 hours.